Rick Perry Hurt Little Girls! Gov Rick Perry knowingly lied and told Texas families that he had the power to force their 11 year old girls to take a vaccine that was killing people in the test trials. 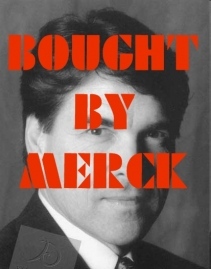 Perry was Merck's ace in the hole,now he will be their man in the White House if they have their way. 1 Comments in Response to Rick Perry Hurt Little Girls! For my entire life, I've watched people cowtow to supposed "experts" and "intellectuals". I understand that somewhere in the far, far past human animals somehow programmed themselves to think more highly of other "humans", who appeared to know more or be able to do more than they than they do of themselves. If this is indeed the case, as humans dumb-down and continue to value the inane, simple-minded, disfunctional, tawdry, and least valuable of human qualities and achievements we are certainly in the final days of civilization. There is little left of even a pretext to a better future. C'mon, guys...At least act like you have some smarts. Here's the secret to life: We live until we die. Every person on earth,who hasn't negated his/her/humanity by denying the same to others, is of value in some context. We are human because we know we are alive and are cognizant of our mortality, coupled with our ability to reason and empathize. We are autonomous and free, by the nature of our being. If we give away our status to "governing forces", we are denying and deminishing our worth of they are not themselves as "human" as we. Everyone on earth knows something that someone else doesn't; if it supports or enhanced the quality of life, it is of value to all; if it doesn't, it is still of value to someone; it might be the one thing that makes an individual a special "human". Whatever you know or don't know can't, in fact, be reduced in value by whatever another knows. NOBODY KNOWS EVERYTHING! I defy anyone to produce the person who can quote every bit of information contained in the holdings of the Library of Congress. Be very leary of the people and events you chose to pattern your life after. Most everyone has the brain power to make reasoned and rational choices. If you have been a "wheel watcher", cared more about a TV character's problems than those of your kids, thought that your job wasn't as important as the sub-human parasite(s) who steal your wages or privacy or future, or think that some slug with a college degree can tell you how to raise your family and love your children, think again! I have no motive to lie to you: Perry doesn't know squat! Given his biases, he only knows what suits his view of (your) existence. People who have more education than you, simply have more education. How many heart surgeons do you know who can rebuild a transmission of any kind? Or, how many snotty little divas do you think could give birth to a child, without the aid of a high-tech hospital? Do you know any attorneys who can build a garage from the ground up? Need I say more?